It has been said that a workman is only as good as the tools he uses. There is some truth in this old adage, though the skills of the worker are clearly important too. At MegaSaw, we know from experience that the performance of the tools we use is the key element in the quality of the rock drilling services we provide. Establishing a reputation for excellence is something that we have taken extremely seriously throughout our 40-year history. We have achieved this by taking a careful look at the quality of the tools we use. It would be wrong to believe that every company drills rock in the same way, with some providing both time and cost efficiency that is superior to others. Our choice in using air powered rock drills has helped is to provide a service that boasts a consistency in the quality you demand and a reliability that makes meeting deadlines a certainty. But why is the role of air-powered drills so significant in our rock drilling services? And what are its qualities that place it above its hydraulic cousin? Air powered machinery is probably better known as pneumatic machinery, and uses the energy contained in compressed air as its power source. It’s pretty self-explanatory to be honest, but the technology is much more common than people think. For example, every time you ride a bicycle you are benefiting from pneumatic technology because it is the air in the inflated tyres under you that is keeping you moving smoothly. Without it, the energy efficiency in a bicycle would fall dramatically, with considerably harder peddling needed to keep the wheels turning. Of course, pneumatic also relates to other gasses, not just air. Steam engines use high pressure water vapour (steam) to drive their parts as well as the helium in balloons too. These drills are supported by a portable air compressor, which usually runs on the power created by a diesel engine. The air is compressed and pushed through tubing and into the drill, with the air forcing an element of the drill (known as the chuck) downwards. The chuck, in turn, forces the attached drill bit down and when the air has passed, the chuck lifts up again, allowing the bit up too. The rapid repetition of this action is what makes the drill-work break up hard surfaces. Hydraulic machinery uses liquid as its power source. Think of an old-fashioned flour mill, with its huge water wheel on its exterior being turned by the water current in the river it dips into. Through this power, the wheel turns and through an intricately designed mechanical structure comprising shafts and cogs, a mill stone is turned to crush the wheat and powder into flour. A hydroelectric power station is a more modern example, with the power of water turning turbines to create electricity. While hydraulic powered rock drills have for decades been a trusted option, there are certain advantages that an air powered rock drill offers that has convinced many of us to use them for our rock drilling services. Our choice of air powered tools effectively allows us to deliver a higher quality service. The technology provides a precise drilling capability, which means we can complete a more complex operation that meets the demands of some very specific projects. An air powered rock drill is capable of creating very precise holes in hard or soft rocks as well as in concrete. This is particularly important when drilling in standing structures, such as bridges and buildings, where demolition is not required but where strategic holes are required to accommodate the installation of strengthening materials or corrosion prevention electrodes in concrete beams. The Rate of Penetration (ROP) of air powered rock drills can be higher than that of rotary drills. In fact, up to 5 times greater ROP according to some estimates, and depending on the hardness of the material it is drilling through. This is down to the frequency that the bit impacts on the material – 40 times per second (pg 15) with air powered rock drilling. What is more, the system is more efficient because they remove rock fragments by the hammering motion – with tri-cone rotary drilling, for example, the fragments are pushed out between the heads, which can slow the drill down. With the ROP so good, the economical aspects of the air powered rock drill is also more impressive. Its efficiency means it produces at a higher quality in a shorter period of time, the drill breaks down less often and drill bits need replacing less often. What all this means is that costs are kept low, which is better for your budget. It is no secret that MegaSaw has built a reputation for high quality work, in everything we do. It’s a cornerstone of what we are about and in an industry that has developed so rapidly with a litany of technological breakthroughs, it is something we continually strive to maintain. The experience of MegaSaw as a company and the skills of our individual team members, will only get us so far. The rest is down to the effectiveness of the technology we use. 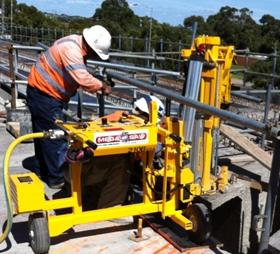 It is why we are one of the most trusted rock drilling service providers operating in the Melbourne and Victoria State area and is used by clients from across the board – domestic, corporate, local authority and government. For more on our rock drilling services, and how our expertise can be the solution to your drilling project needs, call us on 1300 920 419 and speak to one of our team. Or you can email us at [email protected] with your query. We’ll be happy to help.